In honor of International Tiger Day, FOUR PAWS is highlighting some of our important work being done for tigers. In 2013, we rescued six tigers from the Starlight Circus in Germany. These tigers had spent their lives in transport wagons or inadequate and small outdoor enclosures. When they weren't traveling, they were forced to perform unnatural acts in the circus. 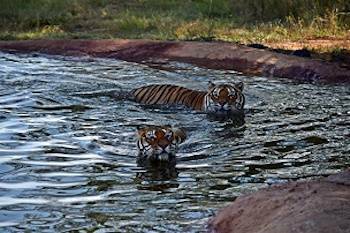 FOUR PAWS worked with the owner of the circus to transfer the tigers to LIONSROCK, where the tigers Khan, Radja, Douglas, Shir-Khan, Prinz, and Pascha can now spend their time swimming, climbing trees, and enjoying a spacious, natural environment. This day serves as an important reminder as to why we at FOUR PAWS work to save and support these magnificent animals. Some of our greatest successes have allowed our rescued tigers to enjoy the next stage of their lives at LIONSROCK Big Cat Sanctuary. 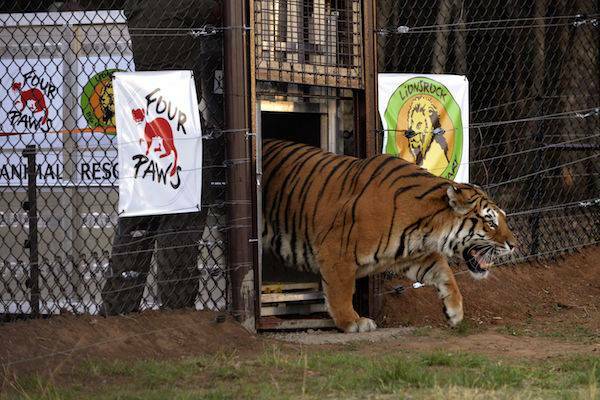 Currently, we care for fourteen resident LIONSROCK tigers from zoos, circuses, and other abusive situations. While we are proud of their rescues, we recognize that there is still much more work to be done. Whether they are being used for entertainment or raised for canned hunting, there are so many tigers experiencing a lack of compassion and humanity at the hands of humans. Captive tigers are not the only ones affected. The world’s tiger population has dropped by 97% in the last century, from 100,000 to 3,500. There are more tigers now living in captivity than in the wild. Poaching is the greatest threat to tigers in the wild, and though FOUR PAWS does a great deal to help many tigers in captivity, we strive to improve the lives of all tigers both through individual rescue missions as well as pushing for animal welfare policy and legislative changes.